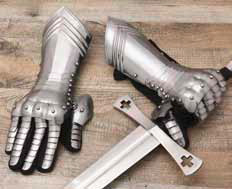 Stylish Medieval gauntlet, featuring fully articulated fingers and wrists. Embellished with elegant ridge embossment and cut out heard detailing. Crafted from leather and riveted steel. These are fully wearable. This page was last modified on 2 May 2014, at 18:46.